On May 7, traffic was reduced to one lane in each direction as construction crews applied the final aesthetic layer of concrete and finalized repairs to roadway surface and curbing damaged by the boulders. 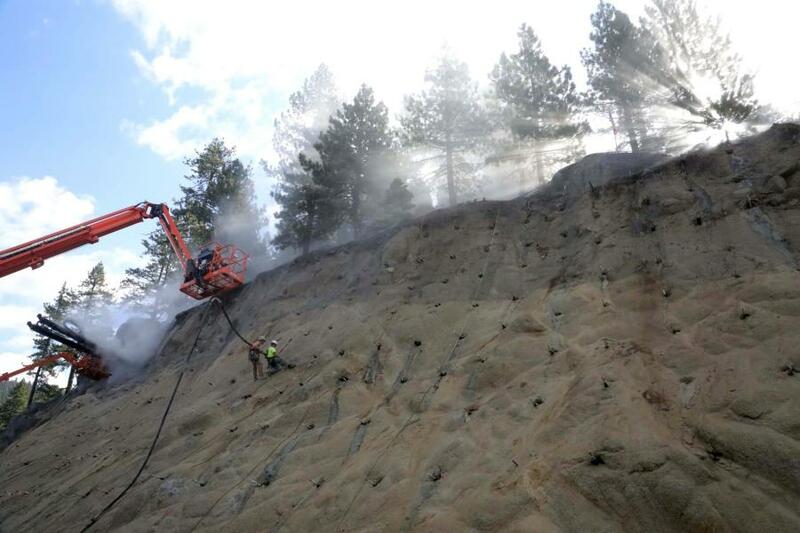 On May 7, single lane closures were put in place on U.S. 50 near Cave Rock at Lake Tahoe as the Nevada Department of Transportation completed roadside slope repairs. In the winter of 2016-2017, numerous boulders the size of large passenger vehicles fell from a roadside slope onto eastbound travel lanes of U.S. 50 near Logan Creek Drive north of Cave Rock. Last summer, NDOT began construction of a roadside wall to reinforce and encase the approximately 60-ft. high slope and help prevent future erosion. Anchor bars were drilled into the slope to secure heavy-duty mesh. The mesh was then covered with more than 1,000 yds. of thick sprayable “shotcrete” concrete to create what is called a soil nail wall. On May 7, traffic was reduced to one lane in each direction as construction crews applied the final aesthetic layer of concrete and finalized repairs to roadway surface and curbing damaged by the boulders. The concrete will be hand-sculpted to match colors and textures of nearby natural roadside slopes. Construction is anticipated to complete, and the highway opened to two lanes in each direction, later this year. The approximately $5 million project by contractor Road and Highway Builders will enhance safety for the more than 13,000 motorists who drive the road daily.